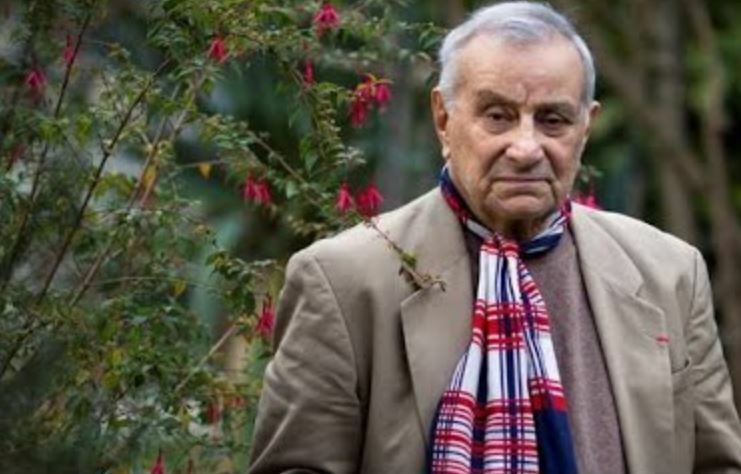 Arsène Tchakarian, who died on August 4 aged 101, was the last surviving member of the “Groupe Manouchian,” a military unit active in the French Resistance. Named after its leader Missak Manouchian, this Communist network mainly composed of Jews and immigrants carried out numerous armed attacks on the German occupation forces. Twenty-three of its members were executed and three others killed in action. Tchakarian and his comrades fought both as Communists and in defense of their adoptive homeland. The Manouchian group in which Tchakarian fought was part of the “Immigrant [or Foreign] Workforce” (MOI) partisan formation attached to the Communist-led Francs-Tireurs et Partisans (FTP). He like its leader Manouchian was an Armenian, born in 1916 to a family escaping the genocide in the Ottoman Empire. Having arrived in France as a teenager in 1930, using a Nansen refugee’s passport, he soon became active in the CGT trade union. He met the Communist poet Manouchian as early as 1933, during efforts to raise famine relief for their native Armenia. The MOI’s history began long before the war. Already in 1924 the Communist-led General Confederation of Labor (CGT) formed a special organization for the Foreign Workforce, which adopted the name MOI in 1932. With French, German, Hungarian, Italian, Russian, and Yiddish-speaking sections, the MOI was also key to mobilizing French-based communists to fight in the Spanish Civil War. Migrants whose own countries had fallen to fascism played an especially prominent role in the International Brigades’ fight against Francisco Franco. As France entered the war in September 1939 and the government dissolved the Communist Party, many members of the MOI headed onto the underground. Like its foreign counterparts the party adopted a line condemning both sides of the war as imperialist, breaking with its robust Popular Front–era positions emphasizing antifascism and national defence. As a conscript soldier in the Ardennes, Tchakarian did however fight against the German advance, before France collapsed in May-June 1940. Returning to Paris after being demobilized that August, Tchakarian found what he called “an empty city. You saw nothing but German tanks and trucks on the Champs-Élysées. People were shaking. The curtains were shut. Everyone had left.” At first there were few signs of resistance. But having resumed contact with Manouchian, by November 1940 Tchakarian had begun to produce clandestine propaganda against both the German occupier and the collaborationist Vichy regime. Communist resistance activity in the first months of occupation was scattered: not only were party structures weak but the political line adopted in September 1939 (in accordance with the Soviet Union’s peace deal with Nazi Germany) tended to place the two sides in the war on an equal footing. Nonetheless, Communists were among the first to begin Resistance activity on French soil, conducting numerous armed attacks, industrial sabotage and leading a miners’ strike even before the June 1941 German invasion of the Soviet Union. This latter development nonetheless added urgency to Communist resistance movements, which also drew strength from the first signs that, unlike France itself, the Soviet Union would not just roll over in the face of the German onslaught. In March 1942, with the tide of the war already having started to turn after the successful Soviet defence of Moscow, the FTP-MOI formed an armed group in Paris under the leadership of the Romanian communist Boris Holban. In fact, the Allies were already parachuting weapons into France, an arsenal bolstered by weapons stolen from the collaborationists and Germans. Tchakarian’s own first use of arms took place on March 17, 1943, as nineteen-year-old Polish Jew Marcel Rajman directed him together with Manouchian in a grenade attack on twenty German military police at Levallois-Perret. In June, Tchakarian became leader of one of the “commando triangles,” uniting the different Resistance forces organized as the “Secret Army,” while Manouchian took over the Paris FTP-MOI leadership from Holban. Its more than one hundred operations over summer and autumn 1943 targeted the key leaders of the Occupation infrastructure, also raising awareness of its existence. An abortive attempt to assassinate General Ernst von Schaumburg, commander of the Greater Paris region, on July 28, 1943 highlighted the danger the Manouchian group posed to the authorities, as did the September 28 killing of SS man Julius Ritter, chief of the STO organization which recruited forced labor for German war industry. However, even as the Resistance struck such blows it suffered deadly repression. Intelligence had already been tracking the Manouchian group, leaving it untouched in order to draw information on its networks. But finally, the trap was sprung. On November 16, twenty-four of its members (around a third of the total) were arrested; all but one was condemned to death. Twenty-two of Tchakarian’s comrades, including Manouchian and Rajman, were shot at the Forteresse du Mont-Valérien on February 21, 1944. Tchakarian was saved by a former regimental comrade, a policeman who kept him in a Paris hideout. In May he was exfiltrated from the capital to Bordeaux, before heading to the town of Montargis, seventy miles south of Paris, in June. Appointed a lieutenant, he helped liberate Montargis at the head of a group of twenty fighters on August 23, 1944, occupying the German headquarters that had been set up in the Post Office. The FTP-MOI’s activity was particularly notable because it organized specifically immigrant groups in a French national cause. On trial a few days before his execution, the young Manouchian had admirably faced down insults from collaborationists in the public gallery with his famous cry: “You inherited French nationality, we earned it!” Nazi propaganda instead sought to use the presence of foreigners in the Resistance to present it as an alien force, driven by the international Judeo-Bolshevik conspiracy. The existence of the MOI, rooted in an earlier history of migrant unionism, reflected both France’s multinational working class and the presence therein of foreign nationals whose countries had fallen to authoritarian and antisemitic regimes even before the war. Indeed, of twenty-three executed members, only three were French: the others included seven Polish Jews (and another Pole), three Hungarian Jews, one Romanian Jew, five Italians (one of Armenian origin), two other Armenians, and a Spaniard. If Frenchmen pillage, steal, sabotage and kill . . . It is always foreigners who command them. It is always professional criminals and unemployables who carry out their orders. It is always Jews who inspire them. This is the Army of Crime against France. Banditry expresses not a wounded Patriotism but the foreign plot against the lives of the French and France’s sovereignty. Nonetheless, the Communist Party’s need to assert its patriotic credentials in the face of Cold War claims that it fought for a Russian and not French interest meant that postwar party press often overlooked the FTP-MOI’s specific record. In more recent decades, as part of the ideological offensive against the party, revisionist historians even made lurid claims that its leadership had deliberately destroyed the “embarrassing” Manouchian group; a narrative that lifelong Communist Tchakarian strongly denied. Indeed, already in the early postwar period there was recognition of Tchakarian personally (who became a French citizen in 1958) and the Manouchian group more widely. In 1947 a medal of the Resistance was conferred on its members; in 1950 Paul Éluard devoted a poem to the “twenty-three foreign terrorists tortured and shot by the Germans,” and this was followed by a 1955 work by Louis Aragon (in 1959 becoming a Léo Ferry ballad), published on the front page of the Communist Party’s daily L’Humanité. Arsène Tchakarian, tailor, historian, Communist, and commander of the Légion d’Honneur, died aged 101 on August 4, 2018.